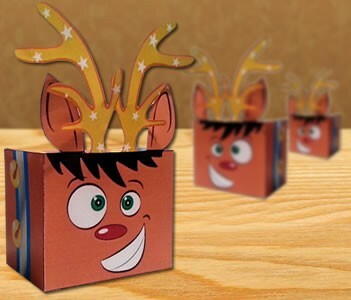 Print out the Reindeer gift box. Use card stock paper for a stonger box. 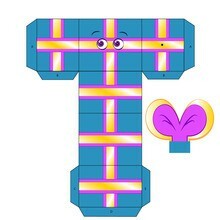 Use scissors to cut out the gift box and both antlers. 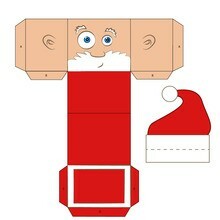 Lay cut out, face down on flat surface. Fold along the line directly below the reindeer's face and fold away from you. Next, fold in the two sides that have the matching bells. Fold tabs A & B away from you. Fold tabs C, D & E inward. Then fold the bottom section with the bells up. Fold the last section inward and your reindeer box should now be taking shape. Glue the B tabs to the blank side of the bottom square. Then glue the A tabs to the blank side of the "tail" section. Use glue on the tabs at the bottom of the antlers. Glue the antlers to the back of the reindeer face. Your reindeer box is ready to fill with your special treat or gift. Close the top lid by sliding the tabs inside the top of the box.